A complex mosaic of post oak and blackjack oak forests interspersed with prairies, the Cross Timbers cover large portions of southeastern Kansas, eastern Oklahoma, and north central Texas. Home to Native Americans over several thousand years, the Cross Timbers were considered a barrier to westward expansion in the nineteenth century, until roads and railroads opened up the region to farmers, ranchers, coal miners, and modern city developers, all of whom changed its character in far-reaching ways. 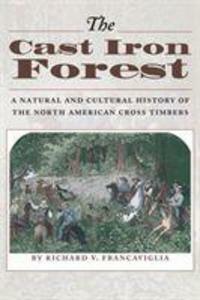 This landmark book describes the natural environment of the Cross Timbers and interprets the role that people have played in transforming the region. Richard Francaviglia opens with a natural history that discusses the region's geography, geology, vegetation, and climate. He then traces the interaction of people and the landscape, from the earliest Native American inhabitants and European explorers to the developers and residents of today's ever-expanding cities and suburbs. Many historical and contemporary maps and photographs illustrate the text.